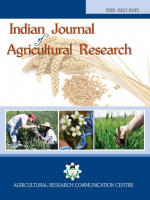 A field experiment was conducted during kharif 2013-14 at Dryland Farming Research Station, Bhilwara (Rajasthan) to study the effect of organic nutrient sources on productivity and profitability of groundnut (Arachis hypogaea L.). The experiment consisted of eight treatments having three organic sources viz., farmyard manure, vermicompost and poultry manure with or without rock phosphate and spray of vermiwsh was laid out in a randomized block design and replicated thrice. The organic sources comprising combined application of vermicompost @ 1 t ha-1 and 0.35 t Rock phosphate produced significantly higher number of pods per plant (18.33), number nodules per plant (13.11), pod weight per plant (13.43 g), test weight (36.39 g) and shelling percentage (54.06), pod yield (1377 kg ha-1), halum yield (2944 kg ha-1) of groundnut over the no manure application and superior over rest the treatments. The pod yield increased due to application of vermicompost @ 1 t ha-1 + 0.35 t Rock phosphate to the tune of 61.62 per cent over control. Application of vermicompost @ 1 t ha-1 + 0.35 t Rock phosphate gave highest net return (Rs. 41137 ha-1) and B: C ratio (3.19). Economics, Groundnut, Organic Sources, Productivity, Vermiwash.